After the two prestigious awards received in the 2012 World Yacht Trophies during the latest edition of the Festival de la Plaisance in Cannes, once again Azimut 55S is under the spotlight for technological innovations and brilliant solutions in the concept design. On the occasion of the 30th Palma Boat Show, which ended May 5th last in Palma de Mallorca, the latest model of the sport collection among Azimut Yachts motoryachts, designed by Stefano Righini and Carlo Galeazzi, received the award for 'best boat under 20m '. 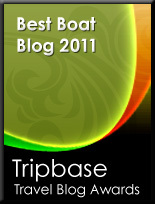 Among the reasons that have contributed to the important achievement: the adoption of the triple Volvo IPS-1 system with pod - unusual on motoryachts of this size - the weight reduction and strength of the structure made of glass-carbon composite, the layout design with three cabins for owner and guests located amidships, the sliding hard top that can be completely opened, the continuity between internal and external spaces mainly due to the one level flat deck and a brand new pivoting bathing platform that facilitates the launch and retrieve of the tender. Besides the Azimut 55S, visitors to Palma Boat Show 2013, could admire the Azimut 88, 53 and 48 presented by Marina Estrella, exclusive Azimut Yachts and Atlantis dealer for Spain, broker and leading distributor in Iberian area for over forty years. Beneteau is launching the first “Barracuda Tour”, a promotional rally in legs which will take place in Brittany from 10 to 19 May 2013. The goal of this event is to bring together the different sport fishing players and to meet up with its amateur sea fishing customers. Saint Hilaire De Riez, 29 April 2013. The Barracuda Tour will set off on next Saturday, 11 May from St Gilles Croix de Vie, historical site and brand headquarters and will finish a week later in St Malo. On the programme, eight legs around Brittany finding outstanding fishing sites to promote the very essence of these fabulous boats created for sport fishing. For this first Barracuda Tour, Beneteau will be surrounded by the best! Lowrance electronics 2014, Honda Marine electronic commands, underwater floodlights - a fully equipped Barracuda 7 and Barracuda 9 will confront each other as they set out to conquer the bass. For the fishing, Beneteau has called on local professional guides as well as specialized equipment manufacturers who will pour out quantities of advice both at sea and on shore: Illex – Element Rider for rods, Daïwa for reels, Fiiish for lures and Henri Lloyd clothing. Each day will be divided among periods of sailing averaging 5 minutes and periods of fishing. A local guide will embark to provide his experience of the areas crossed and the techniques to use. The fish we are looking for is Bass. Each catch will be measured, photographed and put back into the sea. Some fish will be kept in a fish tank and released when the legs are finished. Barracuda owners may join the tour with their own boat and take part in one or several days of this rally. Every evening, a cocktail party organised by the Beneteau dealer for the leg in question will bring together the participants. The new Corsair 32 wins top prize for Best Sport Boat at the Shanghai International Boat Show in Shanghai, China. It was officially announced at the 4th annual Asian Marine & Boating Awards Gala Dinner, held at the Intercontinental Expo Hotel in Pudong, in Shanghai. 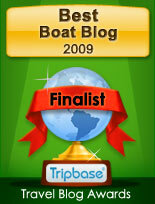 The Chris-Craft Corsair 32 won, Best Sport Boat, in one of the largest categories, beating out competitors such as the Riva Iseo 27. The Shanghai International Boat Show is the largest boat show in Asia with over 300 brands of boats showcased during the four day event from April 11-14, 2011. In attendance to accept the award was Chris-Craft Chairman, Stephen Julius and Chris-Craft Dealer, Xiamen Blue Ocean Yachts CEO, Tina Wu and Marketing Director, Elena Wang. The Corsair line carries the main DNA of the legendary Chris-Craft brand. The Corsair 32 is well-suited to accommodate overnight excursions but is also built for day cruising and quick turns around the bay before a champagne sunset. The Puget Sound Grand Banks Owners Association just wrapped up another excellent rendezvous up in Roche Harbor, San Juan Island. The event took place Thursday, May 9 through Sunday, May 12 with almost all dry weather! With 64 boats in attendance, the weekend was filled with seminars and demonstrations, meet and greets, vessel inspections and a lot of good food! Hunt Yachts, builder of semi-custom luxury yachts from 25 to 68 feet and home of the legendary deep-V hull, today introduced the Hunt Carefree Purchase Program ©, a bold multi-feature purchase program for its express motoryacht line, making Hunt the first power yacht builder to offer a comprehensive, no cost added yacht ownership program and providing peace of mind to new owners of the Hunt 44, 52 & 68 Express and Flybridge Motoryachts. Demonstrating Hunt’s commitment to developing innovative, convenient and owner-focused service features, this program ensures every Hunt is able to perform at its very best. The Hunt Carefree Purchase Program delivers the Hunt Warranty Assurance; free comprehensive service, storage, detailing and delivery for two years; free Vessel Vanguard ship Log Service, remote vessel monitoring and boat monitoring powered by Siren Marine; and a two-year membership to BoatUS with its accompanying free towing feature in more than 300 ports nationwide and free roadside assistance while trailering. On the occasion of the 12th anniversary of ISA opening ceremony on May 10, 2001, the prominent Italian luxury yacht builder, ISA, has officially presented its new ISAYACHTS company logo today, on May 10, 2013. The new logo symbolizes the company’s focus on designing, building and maintaining the best custom motor yachts in steel/aluminium or composite from 24 to 90 meters in length. The new company logo brings together the old recognized symbol and the extension of it right below, colour and font remain unchanged. The previous logo was created in 2000 and has served the company for more than a decade. During that period, ISA has expanded its portfolio and increased its value and relevance to its customers by producing 28 magnificent custom and semi-custom motor yachts to new and many repeat clients and brokers, bringing together very high-standard quality and unique design. International Shipyards Ancona announced the grand opening of its North American operations with an office at the Portside Yachting Center on at the 17th Street Causeway in Fort Lauderdale. It was auspicious timing for ISA as the day marked its 12th anniversary! ISA President of Sales and Marketing, Marcello Maggi, was on hand at a celebratory cocktail party at the Bimini Boatyard Restaurant with brokers, press, and members of South Florida’s marine industry to discuss on- going activity at the shipyard in Italy as well as new marketing initiatives. Ed Sacks, a well-known veteran of the luxury yachting industry, who has enjoyed a long-term friendship with Maggi, gave a colorful anecdotal speech to the crowd on his history in the industry and identified his primary mission. In its relatively short 12-year history, ISA has delivered 27 yachts and currently has five under construction. They build yachts both in fiberglass and steel in the 30-70m range and are developing new lines with an eye toward expansion to eventually build yachts up to 100m. This July will see the first Selene Yachts Rendezvous take place in Europe. The event will be held from 19 to 21 July at Marina Punat Croatia, located in a lovely, small protected bay on the island of Krk. A comprehensive programme has been created for the event, including various activities and presentations for owners and their crew. In addition, there will be some great events such as dinners and lunches with live music and a short wine-tasting tour to the ancient village of Vrbnik. There is also an opportunity for people to visit the event during the open house on Sunday 21 July. 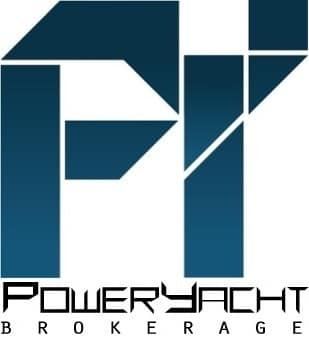 Kadey-Krogen Yachts is pleased to announce the latest release of the company’s industry-leading iPad application. The free app showcases the Krogen trawler yacht lifestyle with photos and stories submitted by owners around the world, specifications and details on all current production Kadey-Krogen vessels, a brief history of Kadey-Krogen and much more. Since the initial release one year ago, the app has thousands of downloads from Kadey-Krogen enthusiasts. The Marlow Marine Cruising Club 18th Annual Spring Rendezvous was held on April 25 thru 28 at the Ocean Reef Club, a private resort in Key Largo, Florida. Members and guests arrived by boat, plane and car to attend this highly anticipated event. Guests were treated royally and everyone’s expectations were exceeded. The first of many surprises planned over the 4 day event was the exterior washing of their boat. Our detailers were ready to hop on board as soon as the vessel docked. After members received their welcome bag, filled with all sorts of useful items, at registration, everyone’s attention turned to the evening’s Welcome Reception. A beautiful setting on the upstairs terrace lent itself to a gorgeous sunset and later a full moon with its light rays dancing on the water. The fancy fare of delicious Hors d’ oeuvres, seafood martini bar, and other delights were enjoyed by the members while renewing and creating new friendships. The musician delighted the crowd with his serenade of song and performance with a variety of instruments. The following two mornings of seminars were well attended with everyone absorbing new knowledge and reinforcing their knowledge of happenings in the boating industry. A hands on demonstration aboard our newest Marlow Explorer 66E, Sea Foam, was presented by Yacht Controller. Other select seminar topics included Medical, Electronics, Engines maintenance, Cruising Reports, and the ever popular round table discussions lead by David Marlow and crew. Our traditional and ever-popular theme party this year was ‘The Wild Wild West’. Keeping in the spirit of the theme, a golf cart poker run Friday afternoon gave us a head start on what lied ahead for the evening’s Western night. The cowboys, cowgirls, Indians, Tonto and the Lone Ranger, along with a multitude of other famous western characters invaded the main beach for the Wild West event. After a scrumptious barbeque steak and seafood dinner, the live western band encouraged everyone to dance into the night. After watching an authentic Wild West show, those who desired to learn the art of pistol twirling, bull whipping and lassoing were instructed by the show team. Libations, dancing, bon fires, and s’mores rounded out the event. The next day, the tradition of Christenings and Open Boats were preceded by a round of miniature golf and an old fashioned hot dog roast. The day moved into evening with our Awards Dinner celebration. Our guests relaxed and enjoyed the southern seafood festival dinner menu while listening to the western singer and guitarist. After the awards, the crowd was treated to a live tribute to Tim McGraw. As we bid farewell and wished happy trails to all at the Sunday breakfast, everyone was already looking forward to next year’s rendezvous and wondering where the 20th Annual Spring Rendezvous will be held. Time will tell and it will be announced later this year. Outer Reef Yachts was presented with a Rookie Team of the Year Award for participating in the 2013 Spin-A-Thon! Total money raised for this event between all the teams and donations is $154,702.68, to benefit Kids in Distress (KID) and Children’s Diagnostic & Treatment Center. Thank you for your generous donations and support for The Reef Riders! The Overmarine Group - Mangusta service for Owners in the western Mediterranean has been further enriched with a new office in Palma de Mallorca. Last Saturday, 4th May, Michl Marine, Group's partner in promoting Mangusta in the Balearic Islands and in providing assistance for those clients who visit these waters regularly, inaugurated the new office in Mallorca which flanks the one already in Marina Ibiza. 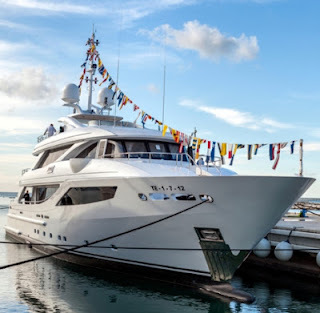 There were many Mangusta enthusiasts present to celebrate the elegant new location, situated strategically in Puerto Portals, a glamorous marina with a unique atmosphere just a few kilometres from Palma. This is an important reference point for Mangusta Owners in the Spanish archipelago, where Michl Marine offers a fast, high quality service, seven days a week to both current and new owners. Princess Yachts International plc are delighted to announce that Richard Lambert has joined the Board at Princess Yachts International plc as M Class Director. This key position has been established to enhance the company's existing capability to support sales of the growing range of Princess M Class superyachts. Richard brings with him a wealth of experience from the marine industry, most recently as Managing Director of the OceanStyle division of the Burgess which specialises in meeting the needs of owners and buyers of semi custom luxury motor yachts in the 20 to 45 metre range. As head of M Class sales Richard will be working closely with the existing sales team, together with the manufacturing and product development teams at Princess. 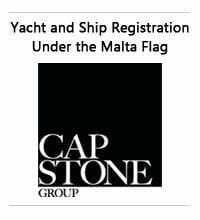 This significant appointment recognises the growth of this important market sector within Princess and has come at the opportune time with interest in the company's expanding range of M Class yachts at it's height following the success of the first Princess 40M at the World Superyacht Awards earlier this month. Development of the company's new superyacht manufacturing facility at South Yard is also moving forward after Princess received confirmation in April that they can begin drawing down on a £4.5 million grant awarded by the Government Regional Growth Fund (RGF) to back a major investment to turn the site into a world leading shipyard. Princess Yachts International is celebrating the success of Imperial Princess, the first Princess 40M from their M Class range of 100ft plus yachts, at the eighth annual World Superyacht Awards held in Istanbul, Turkey on 4 May. During a gala evening held in the magnificent surroundings of the Çiragan Palace Kempinski and attended by a distinguished guest list of superyacht owners, their families, friends and luminaries of the superyacht industry, news broadcaster Natasha Kaplinsky presented the prized silver Neptune awards to the owners of the finest sail and motor yachts delivered in 2012. The Princess 40M has been named as the winner of the 'Three Deck Semi-Displacement or Planing Motor Yachts' category. For Princess to have been selected as a finalist with what is their first 'superyacht' build is an incredible achievement but for Imperial Princess to win this prestigious award and the company be recognised as an important shipyard in the superyacht industry is a great honour for the Plymouth based yacht builder. With over 45 years of innovation and engineering excellence Princess are firmly stamping their marque on the 100ft plus market. The 40M, built at Plymouth's historic South Yard, combines cutting-edge technology with superb performance and the ultimate in on-board opulence. Weighing in at 395 gross registered tonnage, the superyacht has twin diesel engines packing some 7,000 horsepower, and is capable of 23 knots. As the largest composite motor yacht ever built in UK, as well as the most luxurious, the 40M can also boast one of the largest hulls in the world constructed using high-tech resin-infusion technology, for optimum strength, quality and weight. 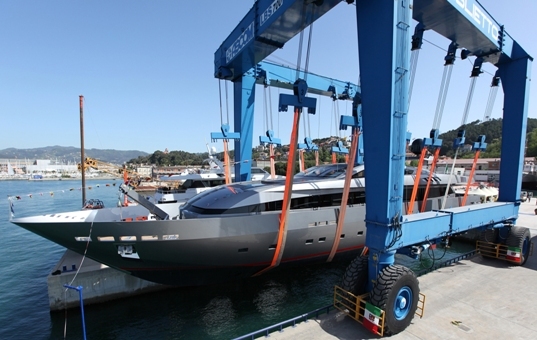 The shipyard continues to invest in their South Yard site, dedicated to the production of yachts 100ft plus, and their M Class product range with a new launch scheduled for 2014. In 2011 Princess were awarded a £4.6m Government Regional Growth Fund (RGF) to back a major investment to turn South Yard into a world leading boat building facility. The investment has already created 290 jobs and helped safeguard a further 400. The Princess 40M has also recently been awarded 'Best Production Motor Yacht (24m to 40m)' at the 9th annual Asia Boating Awards and is a finalist for three awards at this year's ShowBoat Design Awards. Riviera chairman and owner Rodney Longhurst announced today that his family will purchase Riviera’s 14-hectare state-of-the-art Coomera facility on Queensland’s Gold Coast. It is the largest luxury boat building facility of its type in the Southern Hemisphere and the purchase of the property and all of its capital improvements will be completed before June 30. When Mr Longhurst purchased Riviera on 8 March, 2012, he agreed to a long term lease with the option to buy the property. Over the past 14 months, Mr Longhurst has been very focused on Riviera’s future and has placed a great deal of time into restructuring the business, reviewing all internal processes and procedures, investing in new model development, recruiting the right people for the right job, and growing Riviera’s team and talent. Mr Longhurst said the purchase of the property truly cemented Riviera’s future in building boats in Australia, employing Australians and continuing to drive the company’s long established export markets. After visiting some of the world’s highly regarded boat building facilities, Mr Longhurst is confident the Riviera site compares favourably in terms of location, size and technology. Riviera’s 300 strong master craftsman and staff have seen the fruits of their labours over the past 10 days with Australia’s largest and most awarded luxury boat builder winning a prestigious marine industry award, the announcement that Rivera has made a substantial investment in Australia’s manufacturing future, receiving an overwhelming positive response from luxury powerboat enthusiasts and recording significant new boat sales at the Festival of Boating held at Riviera’s Gold Coast headquarters. On the back of winning the esteemed 2013 Australian Marine Industry Large Exporter Award, Riviera’s chairman and owner Rodney Longhurst announced that his family will purchase Riviera’s 14-hectare state-of-the-art Coomera facility on Queensland’s Gold Coast. The announcement came on day two of the second annual Festival of Boating, which proved to be hugely successful for Riviera and Belize with registrations for the 83 individual educational and social events up by more than 50 per cent on the previous year with a total of over 2000 registrations across the four day festival, the world release of the new 565 SUV, and the full interior display of the new 50 Enclosed Flybridge, gave Riviera plenty of reasons to celebrate at the Friday night Cocktail Party and Saturday night Gala Dinner which were well attended with 250 and 350 Riviera enthusiasts respectively at each event. Riviera chairman and owner Rodney Longhurst said the Riviera Festival of Boating was a tremendous success. Riviera CEO Wes Moxey said the past 10 days had been an incredibly positive time for Riviera. The dates for the 2014 Riviera Festival of Boating have been released and an expanded program will be announced later this year for the four days of the Festival from 22 to 25 May, 2014. The Festival of Boating is a registration only event for Riviera owners and luxury powerboat enthusiasts. An exciting new workshop designed to make skippering a small boat child’s play is expected to be hugely entertaining and educational for pint sized captains at the Riviera Festival of Boating held from May 23 to 26 at Coomera on Queensland’s Gold Coast. It is one of seven new educational workshops which have been added to the program since the Festival registration website went live in March. Riviera has been inundated with registrations and enquiries as the date of May 17 when registrations officially close rapidly approaches. The original program of 76 educational and social events has prompted the addition of several new workshops, including the Riv Kidz Skipper Program, which now brings the total to 83 individual events. The new events offered in the expanded educational program include, anchoring, line work, rafting and mooring; onboard entertainment; understanding gyro stabilisers, electrical power systems; understanding electrical accessories, understanding marine insurance, and a special children’s only Riv Kidz Skipper training program. Limited places are available at all workshops and registration via the Festival of Boating website is essential. Riviera’s Chairman Rodney Longhurst said boating was very much a family affair and the Riviera Festival of Boating encouraged all Riviera and aspiring power boat owners to become more confident on the water. Ms Herbert-Evans said most parents were keen to have their children learn the skills and knowledge to handle their tenders and smaller vessels. The Riv Kidz Skipper Program will cover pre-departure boat checks, bungs, fuel, oil, battery/spark and water; safety equipment checks; tender limits; understanding boat and crew limitations; knots line and hitches; check the conditions; let someone know before you go; start, stop, safety, steering, throttle control, trim control and balance; embarking and disembarking; always keep a good look out; manoeuvring, berthing, anchoring; signage and rules; boat maintenance and cleaning. There are two Riv Kidz Skipper Workshops held on the weekend of the four day Festival so people are encouraged to register early to avoid disappointment. Visit rivieraaustralia.com/festival for all the latest Festival news and registration forms. Mr Longhurst said the other programs would give power boat owners the opportunity to trial first-hand the amazing gyro stabiliser technology on board a Riviera 51 Enclosed Flybridge, learn the correct anchoring and line work techniques, explore the latest on board entertainment systems, electrical power systems and accessories, and finally a greater understanding of marine insurance. After a successful Dubai International Boat Show, Sunreef Yachts is delighted to once more announce its presence in the United Arab Emirates with one of its most renown yacht models - the 70 Sunreef Power - already sold in 10 units. 70 Sunreef Power Damrak II will be available for viewing all throughout June at the region's most exclusive marinas: Dubai International Marine Club, Emirates Palace Marina, Yas Marina - Abu Dhabi and will be seen cruising in the area of the Palm Jumeirah. Damrak II has completed the first leg of her passage to Dubai last week, arriving in Genoa after a three week motor from the Caribbean. On Friday she was loaded onto a cargo ship that will deliver her to the Middle East in the beginning of June. With this new model US Miami based builder Nor-Tech challenges other European builders, in this growing market for fast cruiser offering a lot of exterior spaces and socializing area but still suitable to accommodate overnight accommodation for two persons. The Nor-Tech 420 Monte Carlo main characteristics are indeed its exterior cockpit which strikes difference thanks to its very stylish Kevlar finished center console, and its plenty of seating areas which creates a couple of socializing area. Inside 420 Monte Carlo offers a C-shaped, settee, V-shaped berth, and a separate shower head. Nor-Tech has so far not divulged information for the power choices of the 420 Monte Carlo but I can say that hull one was powered by twin Mercury Racing 565hp units. Construction - hand laid sandwich build fiberglass with Kevlar reinforcement, high density core used on sides. Deck and hull glassed together. S2Yachts introduces the next generation of premier American-made yachts with the all new Tiara 50 Coupe. Set to be delivered to key dealerships this fall, the all new Tiara 50 series redefines world class luxury with innovative design, engineering, and performance built for today’s modern lifestyle. The Tiara 50 Coupe salon and bridge deck offer 360 degree panoramic views open to the cockpit through sliding aft doors built with indoor outdoor living in mind. The salon offers a single level deck from the cockpit forward to the bridge where two small steps separate entertaining from the business of operating the vessel. The helm and dash features Tiara’s proven sensible ergonomic placement of controls and gauges leaving plenty of room for flush mounting electronics. The all new Tiara 50 Coupe is powered by twin Volvo IPS propulsion systems in standard 600 or optional 700 horsepower configurations. The technologically advanced Volvo IPS II power plants are matched to a successful ocean proven hull delivering a solid ride. The Tiara 50’s design cues bring a sense of sleek styling, exceptional performance and luxurious comfort, intended to appeal to a broad spectrum of consumers. A wide range of options offers owners the opportunity to customize the vessel to match their personal style. Another important launch for custom sportfish boat yacht builder FandS who this time put into the the water a 50 Convertible model, the Hull number nineteen for this Delaware builder. FandS has been one of the custom Sportfish builder who push the boundaries of there designs to new heights. This 50 Convertible is designed by Matthews Yachts to what is a very sleek looking and a softer to the usual curved Carolina shear line. Inside the 50 Convertible features three double cabins, with an owners room to fore, a guest double cabin to midships, and bunk third cabin to starboard. A single large shower head serves all the three cabins. The living is located on the main deck this featuring a galley L-shaped saloon, and a two person sofa. Power is twin Volvo 700hp engines with pod drives propulsion. XL Marine presents the new Tender project based on the hull of its top seller and first produced 43 model. As is paramount in the XL Marine models the 43 Tender follows on the input of traditional US and Italian open boat lines, but here this 2005 founded boat builder located in Rome Italy gives a boost to its creativity side. See the option as in the second picture for opening side bulk heads for example to this. Criteria for the the XL Marine 43 Tender is a full walk around flush deck which bring new input to its runabout sport cruiser spirit. The standard exterior layout features a center console helm which can be ordered with a hard top, large settee and dinette to fore, and a two by lounge sun pads at aft. Inside the Italian builder has not given ideas of what it features but I can speculate that a shower head, small galley and double berth can be featured. Still as XL has shown in the past years customization is very important in all its models, all the 43's are in fact different to the others with a half a dozen layouts being available, and the company declares it again for this new entry level project. The XL Marine 43 Tender can be powered by twin diesels I imagine to a similar output to those of the standard 43. But here again unlike the 43 delivered in fifteen units so far XL Marine can also put surface drives propulsion units and allows max speeds up to fifty knots. Those passionate about classic sports boat will surely know this prestigious Italian name which is among the most respected builders, creating a fame for luxury fitted runabouts in the last fifty years. This respected boat builder was founded by Giacomo who signs the yard as custom in those days with his important surname Colombo in 1956. Colombo was acquired by the Sarnico Group in Summer 2007, who since then have already launched three totally new models. The current Colombo range offers ten models and starts from the 25 Super Indios and goes up to the 39 Alldays. It is also worth noting that two models of the range are fitted out in a rare building way of mahogany finish outside but with a shell build of GRP. The models offered in this finish are the 32 Romance, the first built in this technique introduced in the mid nineties and the later produced 25 Super Indios. The new Colombo website so far available only in Italian takes you around with the following buttons: Profile, Models, Galley, News, Events / Shows, Dealers, Press Room, and Club Colombo. Link from the website are also Colombo social hubs; Facebook, Twitter, Linkedin, Pinterest, and Youtube. The launching ceremony of this spectacular 41-metre yacht, initially though as an ordinary one, transformed into a very emotional event thanks to the very affectionate words both of the owner, a repeat client for ISA, who emphasised in a long and unexpected speech how proud he is in belonging to this Italian shipyard and how the company always treated him and his crew with professionalism, accuracy and commitment. This steel-aluminium displacement motor yacht is the 28th unit built by ISA in its twelve year history. Exterior design by Andrea Vallicelli, interior design by ISA interior department, managed by Daniele Socci, Aziza yacht will be officially presented at the boat shows in September, showing once again ISA’s distinguished very high quality standards and unique design. The positive market feedback is assumed as the 41-metre motor yacht Aziza with huge volumes is today the only alternative for a good quality steel/aluminium boat of this size. As a final point, this is the only 2013 launching as the projects presently under construction at ISA will be completed next year, so get ready for a glittering 2014 and stay tuned! Numarine continues to bring new projects all aimed to upgrade and complete its line. The 68 HT is the latest of these new projects and follows on the exterior the theme this Turkish builder and its designers showed with the 78 model, of very aggressive exterior lines. The 68 HT also adds as is custom from the more modern looking yachts coming out at the moment to make full use of the foredeck, here the area having two sun pads and a settee with central table. Inside the 68 HT offers an interesting spacious layout with four double cabins, with the standout features here being the full beam owners stateroom, and the bunk fourth cabin. Interesting all cabins are supplied with there own private heads. Crew quarters are located at aft and feature two berths, a shower head, and an L-shaped dinette. The galley is located on the main deck, to port side of the helm station. Engine choices start from standard 1000hp MAN to optional 1200 units. Cummins presented its new QSB6.7 550hp during the Miami boat show, past February 2013. 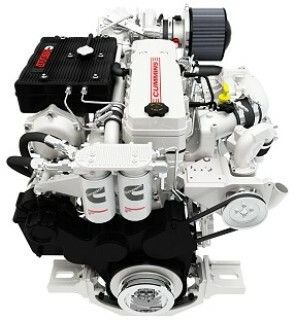 The Cummins 550 hp diesel engine, now offers the power density needed to reach high speed with a dedication going to the performance boat market in making of this new power unit. Diesel engines offer a number of benefits compared to gasoline engines, and this is particularly evident in the performance power boat market. Diesel engines have lower maintenance costs, better overall dependability and longer warranty coverage period. There are also significant service interval differences between diesel and gasoline engines. The Cummins QSB6.7 requires an oil change every 250 hours while an the same thing is required every 25 hours on a comparable performance gasoline engine. A comparable gasoline engine also requires valve spring replacements between 100-125 hours as well as a major refresh between 200-300 hours neither of which are required with the Cummins QSB6.7. Diesel engines provide better overall dependability than gasoline engines, as well. The Cummins QSB6.7 provides 550hp turning only 3300 RPM while a comparable gas engine provides similar hp between 5000 - 5400 RPM. Higher engine speed causes more stress and wear on the internal components resulting in a shorter life expectancy. The QSB6.7 550hp is backed by the standard Cummins 2-year/1000 hour warranty with additional 4-year/2000 hours of coverage for major components. With the Prestige 550 S, the designers and the French boat builder part of the Beneteau Group gets as close it can get to a sport coupe yacht versus the flybridge. It gets so close that the Prestige 550 S also offers a fly deck albeit reserved for sun bathing. Still the team of designers JandJ, Garroni, JP Concept offer a complete sport yacht comfortable for a long Summer cruise with three spacious guest cabins, plus a crew cabin located aft. Standout features in the 550 S which has same layout as the Fly are a few, but I can tell you about the separate entrance staircase to the full beam owners stateroom located to midships, the astern galley, and the sun deck on top of the hardtop. Power is twin Cummins 600hp with propulsion coming from the ZF Zeus pods, which give a wide open throttle speed of 30 knots. One of the most successful flybridge motor yachts that Maritimo has produced, the M48 Cruising Motoryacht, has undergone a complete makeover and the new larger and more refined M50 Motoryacht is its new replacement model. Before the first M50 Motoryacht was completed there were two sales in the USA as a result of the Fort Lauderdale International Boat Show and discussions are underway with other prospective purchasers. The first M50 has now been produced and delivered in the United States. The original M48 has been one of the company's most successful models with more than one hundred sold internationally and satisfied owners now using their M48 in places as far away as Italy, Spain, the UK, the USA and the UAE. The new look M50 cruising motor yacht takes the tried and proven and enhances it even further thanks to a longer hull and new features as a full beam midships owners cabin, and an astern galley configuration. The M50 Motoryacht builds on Maritimo's latest novelties of an enclosed flybridge design, internal staircase, and safe walk around decks. Power for the M50 Motoryacht is twin Volvo 670hp engines, so far no speeds are announced but Maritimo said in its first testing run the new model registered a 10% saving versus the M48 model it replaces. Delta presents the second model in its Open series range unveiled in 2012 with the 26, the 33. The 33 Open is again a design coming from Ted Mannerfelt, same designer for the 26, and this is his second design for Delta powerboats. The Delta 33 Open is in real terms is a dayboat with good overnight accommodation for four people, and represents a challenge to other Italian builders who offer a similar concept in this size. The lower deck offers accommodation for four plus a seperate shower head, while the outside is the convivial full beam area which makes of the nearly full use beam of the boat, thanks to the semi walk around up to midships design. Outside is also located the galley to port side of the helm. The helm to starboard offers also an interesting settee which can become various things from a settee for passenger underway all looking forward, to a social settee for two, or a dining area. The Delta 33 Open is build in Diab core infusion technolgy which saves the weight to just about four tons. Power comes from a single Volvo 400hp or twin 220 units both in stern drives propulsion. Top speed estimates are 43 knots with both the engine choices. Nor-Tech from Florida USA presents a new World Wide web showroom. Nor-Tech was founded in late 1980's introducing the 5000 V-hull model. The company first started operating in Cape Coral, Florida, later on in 2002 expanding and moving to a bigger location North Fort Myers. Important model additions in Nor-Tech was the 5000 Supercat in 1999, and the 390 Sport in 2009 its first center console. Today Nor-Tech offers four ranges; Catamarans, V Bottoms, Center Console, and Yachts which total fifteen models. The current Nor-Tech entry level is the 298 Sport from the Center Console range, while the flagship is the 80 Sport Yacht, with the latest models being the 477 SPX and 420 Monte Carlo. Nor-Tech new website takes you around with the following buttons; Home, About, Inventory, Models, and Contact Us. The new Nor-Tech website also features links to its Facebook, Twitter, and Youtube social pages. Canados presents the project for a new 106 which will join the flybridge range and shortens the bridge between the successful 86 and the 120 models launched last year. She features exterior and naval architecture by the Canados Design Team, while Cristiano Gatto Design was in charge of the fully custom interior. The new 33 meter super yacht pursues the Canados history and tradition: performance, reliability, attention to details and technologies with high level of customisation. She also introduces new distinctive design elements outside: for the first time a Canados features large side windows in the hull on the main deck which allow more light for the dining and the owner’s suite, and also shows the two sofas forward by the large sunbathing area. Like all Canados yachts, the 120 reveals fully custom interiors. The living and dining areas, the galley and the day head are placed on the main deck. The owner’sstateroom is located forward on the same deck and enjoys a panoramic view. Accommodation is provided for six guests on the lower deck with a VIP, a double which can be converted into a twin if required. The crew accommodation is located forward in the lower deck with three cabins.The decor features light oak for the walls and the furniture, teak for the floor. 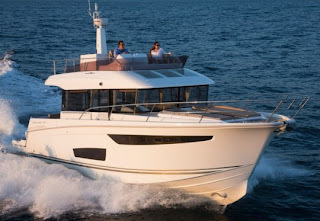 The new Canados 106 is to be launched by Summer 2013 and is to be powered by twin MTU engines with a cruise speed of 24 knots being estimated. Galeon 390 HTC was launched earlier this year 2013 and the Polish builder was fast to provide an alternative layout version to this model now offering a new two cabins plan. In this two cabin version a lot of things change in the layout from the galley which moves down, to a saloon which is now totally reserved for relaxing. The galley takes the place of the third cabin located to port side midships just by the three steps staircase. The Galeon 390 HTC is a hard top fully enclosed sport cruiser and was based on the 380 Fly, and is powered by six engine choices from 220 up to 435hp with line shaft or stern drive propulsion. Magazzu seems set to continue to upgrade its range of Rib Cruiser and Yachts and presents the project of its second in size model the MX-16 Coupe, two meters shorter to its current flagship the MX-18. This new project from Magazzu follows the core concept of the R.I.B. line from the Sicilian island builder of performance with a three steps deep Vee hull being used. Accommodation wise the MX-16 Coupe is offered in two plans. A two cabins, single head, L-shaped saloon, and galley is standard. An alternative layout is a single master cabin this being larger and added with two L-shaped bunks by the side of the bed, two heads, L-shape saloon, and a dining area. In this second option the galley moves on the main deck with the helm station being a two seater instead of the standard three seats center console, and is located to starboard. Power options are varied and go up to 1600hp with surface props or stern drive propulsion choice. Top speeds of 55 knots are estimated with the larger engine choice. 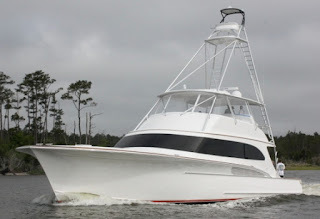 It's been a long time coming for Carolina custom boat builder Jarrett Bay new 77 Sportfisherman flagship model which started construction intially in 2008, then cancelled and restarted about three years ago. 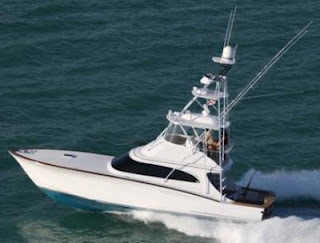 Build as all Jarrett's Bay in the cold molded method hull 56 from the Carolina builder follows its traditional line with the curved reverse shear line and the flared bow the sport fishers from this area in the USA have as trademark. The Jarrett Bay 77 Sportfisherman is in short words another important milestone for the Beaufort Notrth Carolina custom boat builder, increasing the size by ten feet from Hull #54. The interior standard layout of the 77 features four double cabins, with a main deck having the living open saloon with its relaxing settee, dining area, and bars. The aft deck with a 250 square feet area will be all geared up for angler ammenities. Power is twin 2600hp engines which give wide open throotle speeds up to 42 knots. OceanClass is the re-brand of the models at fifty feet plus coming from the Greenline stable owned by the Seaway Yachts group. The first model to come from this brand was the 70 labelled at launch as Greenline about, but now Seaway is making OceanClass becoming its own reality by adding this new 57 and 88 projects as future additions. Designed by J and J Design for the OceanClass 57 the architects create external looks similar to what they showed with the 70. An interesting feature of the external design are the two reverse shear lines. The one at middle has the design use to give the saloon windows full view, and the other more to aft divied cockpit deck from side bulwurks corridor. Inside J and J also went for a more traditional set up by putting the owners statroom to fore. But the surprise is that this at least on plan looks to be spacious if not more to midships full beam. The living on the OceanClass 57 is all located on the main deck with the galley splitting the saloon from the more relaxing area to those of dining and helm. Power is twin 600hp engines with twin line shafts propulsion and a top speed of 24 knots being estimated. Palm Beach from down under Australia continues to upgrade its range of down East inspired traditional looking cruisers and yachts presenting the new PB45 Express. So far Palm Beach has been a success for its unconventional lobster boat looks, winning the prize of best looking boat for a twice in a row. The Palm Beach PB45 Express is the range new entry level and comes out from a shortened PB50 mould, re-engineered and rethought after client demand. Choices has always been a part of Palm Beach with a clever semi custom approach also continuing in this new entry level model which features five different interior layout options. To make it short some important options come here from an astern or below galley, to the guest cabin being different or replaced by an office or lower saloon. Power is twin Volvo 300hp with IPS pod drives which should give a maximum speed of 30 knots. 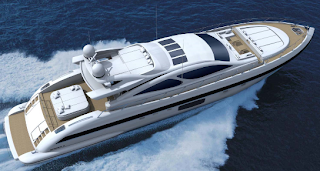 Astondoa continues its extension of its Motoryacht line, which started in recent months seeing a host of new projects and model being presented. Designed by Italian architect Christian Gatto the 86 GLX is the Spanish builder future offer in an interesting super yacht dimension size in over all length and just under it to what regards regulations. The design is modern but Astondoa with Gatto in the 86 GLX follow more conservative looks unlike the new 65, 72, and 80 GLX models. The layout also offers an interesting diverse plan with the semi raised pilot house creating aggressive looks outside made to put the galley in a location to fore. Unusual in this size I might add. Four double guest cabins are located below, with the owners stateroom to midships, and VIP to fore. Two crew cabins sleeping four in bunks but supplied with two shower heads are located also to fore peak, and these are cleverly connected to the galley. Power is standard MAN 1550hp, or optional 1800 and Cats 1885 units. "Monokini", the third hull in Baglietto’s FAST 44m line, which marks a true rebirth for the Seagull brand, was launched last Saturday. The ceremony, which was held privately as required by the owner, was attended by his representatives, Baglietto’s employees, who were present with their families, the Company’s Suppliers, and the Top Management of builder and the Gavio Group, which controls the La Spezia based shipyard. Some local and regional authorities also took part in the event privately, so as to celebrate Baglietto’s recent comeback in business together with the Company and its staff. "Monokini" is the natural evolution of the 44 FAST line, whose first two models were M/Y Tatiana per Sempre and her sistership Apache II. Featuring an aggressive silver hull, this yacht is characterised by streamlined, sleek outer lines reflecting the unmistakable style of designer Francesco Paszkowski Design, who keeps interpreting the Seagull’s philosophy at best. Her soft, stylish interiors have been created by designer Alberto Mancini, while Baglietto took care of naval architecture and engineering aspects. 44 meters long, over eight wide and featuring an aluminium hull and superstructure, this yacht can host ten passengers in five cabins, all located on the lower deck, as well as 8 crew members. Thanks to twin MTU 3600hp engines she can reach an impressive maximum speed of 30 knots in the utmost comfort, while the four at-anchor stabilisers grant flawless stability even when the yacht is far out at sea. The interiors draw inspiration from the rational and yet sophisticated world of aviation. Wood, steel and leather, the materials used all over the yacht combine harmoniously into a skillful blend of cream, beige and grey shades that create a stylish, refined atmosphere. The wood used for the bulwarks, bleached sycamore can also be found in all ceiling panels and, together with the ash & Wengé parquet and the dove-colour silk inserts, conveys a sense of calm and refinement. The atmosphere is comfortable and relaxing, similar to that found on large private jets, and is further enhanced by a skillful use of lighting, aimed at 'softening' the wood curves even more. Almost all interior and outdoor furniture is custom-made: sofas, tables, lamps and handles have indeed been customised to fulfil the Owner’s wishes and requirements. A distinguishing feature on this yacht versus the two previews 44m models are also the two collapsible side balconies: which become wonderful terraces allowing guests to enjoy incredibly relaxing moments just over the sea. The yacht will be classified RINA and MCA for commercial purposes. Sailors say is about the voyage, while motor boaters will tell you its the destination. Does the Jeanneau 42 Voyage call to sail boaters with such a name? 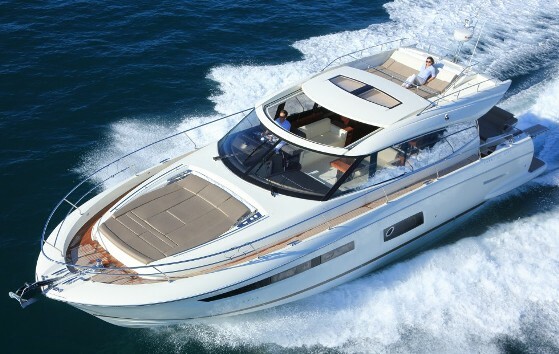 The Jeanneau 42 Voyage is a very difficult model to label. Designed by renowned British designer Tony Castro you can call it in many terms a planning motor boat with explorer looks. But Jeanneau tells that the planning hull of the 42 Voyage can cruise comfortably at all speed with special features going into the project to make this possible. Comfort wise the 42 Voyage offers two double cabins with en-suite shower heads below. The living is located on the main deck this being an incredible light area thanks to the all round trawler like window. Power is from twin Cummins 380hp with line shafts. Lancer Yachts from Brazil sent us renderings and plans for a project of a new 327. The 327 adds this Brazilian company its second model along the well received 277, with Lancer design team and Bruno Gonzales with Odillo da Silva following a similar looking pattern to the smaller sister. Integrated windshield, extended aft bathing platform, and large view windows for the midships cabin are the main feature outside. The aft deck characteristic is a semi circle dinette. Inside a two cabins layout is presented with a double berth to fore, and to midships. In between the cabins is a dinette with galley opposite located to starboard. The guest cabin to midships will also feature a second head, something unusual to be found in a ten meter motor cruiser. Engine options are not yet advised but the plans do show the 327 with a single engine and stern drive propulsion. Just a couple of days before its Boating Festival, Riviera put into its enviroment the new 565 SUV a continution this range which started with the 445 launched in 2012. With the SUV series Riviera aim is to combine the high performance blue water cruising capabilities of the classic Flybridge with the fish raising abilities of the Offshore Express, and the single-level leisurely entertaining features of the popular Sport Yacht series, creating a unique true bridge between the other range from the down under firm. The 565 SUV features a three cabins and two bathrooms layout, with a flexible accommodation plan amd sleeping capacity for six to eight adults. The stately full-beam master suite features a king size island bed, large hull windows and optional opening port holes for cross ventilation, a walk-in robe, and a lounge. 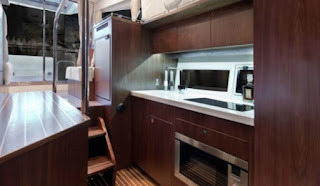 The forward cabin has an optional layout with the choice of either a queen size island bed or a triple bunk bed arrangement, as displayed on hull one. This cabin also features large hull windows and deck hatch for ventilation. The third cabin has two metre long bunk beds, making this vessel ideal for extended stays aboard with family or friends. The new 565 SUV has many clever design and aesthetic features such as the sleek low profile hardtop, with two large manually sliding glass sunroof hatches, which bring an abundance of natural light and fresh air into the saloon. The large helm station to port has plenty of room for electronics including three display screens, controls and a joystick. There are four high-quality helm chairs, two of which swivel 180 degrees to face the saloon allowing occupants to join in the conversation in the saloon area. A key design feature that sets this model apart is the expansive and uncluttered cockpit space with plenty of storage including, an insulated fish bin to starboard, plus clever storage inside the engine room hatch; simply lift up the hinged cockpit floor and the two large fore and aft fish/storage bins lift with the deck whilst a third square storage compartment is revealed. The mezzanine seating to port also features a top loading refrigerated cool box under the seating. There is the option to have a barbecue centre in the transom with barbecue, sink, rubbish bin and storage or optional live bait tank or standard storage bin, as well as an optional hydraulic swim platform for a smaller tender. Engines are twin Volvo 700hp with IPS900 pod drives which give a top speed of 32 knots. Codecasa from Italy presents its new World wide web showroom. Codecasa was founded in 1825 by master craftsman Giovanni Batista. Since then five other Codecasa take the helm of the company; from Antonio, Giovan Battista 1902, Ugo and Sandro 1946, and last Fulvio in 1976. Today Codecasa operates three distinct facilities in the Viareggio Tuscany area, with a production which starts at 30 and ends at 70 meters. In the last decade Codecasa has also expanded a line of fast yachts build in alloy from 35 to 50 meters. Currently Codecasa has three yachts in construction; C.120 50S, C.121 50 Serie Vintage, and F.75 42 Serie Vintage. Codecasa new website is available in Italian and English language and takes you around with the following buttons; Codecasa, Yachts, Projects, For Sale, Service, Production Sites, Media, and Contacts. As is standard today Codecasa also features its social network hubs; Facebook and Newsfeed both with a direct link from the website. Waiting for its new flagship 100 RPH to become a reality, Hatteras decided well to update and tweak its current largest model, the 80 Motor Yacht. There are many differences which distinct this new generation 80 Motor Yacht from its predecessor from sleeker side view windows in the full beam midships located owners stateroom, to a fore deck settee, and a leaner stern with the option of an up and down bathing platform. Three total options characterize the 80 Motor Yacht in the layout, from the choice of an optional Skylounge, to two versions of the guest cabins plan. Both of which four cabins and the main difference of having two heads one of which takes place of the walking wardrobe in the standard plan. It was just 2010 when Greenline debuted its 33 model, an innovative hybrid powered explorer cruiser which in just a couple of years caught the interest of three hundred plus buyers. Fast forward to 2012 and the next Greenline, the 40 model is launched along with a new line of OceanClass flagships which debuted also in the same year with the 70. Now the next chapter for Seaway the mother company is this 46 project a three double cabins hybrid flybridge motor cruiser. Designed by JandJ Project and engineered by Seaway, this new 46 surprises for its comfort and well laid interior which will receive a lot of good market feedback thanks to the three cabins layout and astern galley. Power options will be a four engines choice from Volvo and Cummins which starts at 220 and ends at 380hp. Top speed is 23 knots with the large engine choice and a 20% load. The electric motor option at 60V can give a max speed of 6 knots, 4 of cruise and a 20 nautical miles autonomy. It seems that after a year with not much happening, the Endurance racing series of offshore powerboating might have a better turn around in 2013. So far we have three Grand Prix announced; Netherlands from 24 to the 26 May, Belgium from 15 to 16 June, and then its again in the Netherlands from the 5 to 6 October. This is definitely a start and looks much better to what the 2012 season looked like, when only the Rome Offshore Speed race was scheduled in July. Hopefully a couple more places will join up if the excitement bulb switches on. We know that Italy has always been passionate about the Endurance class, so hopefully some race can also happen in the South European peninsula. Italians along with US drivers and builders carries the most success in this series, even before it went in a category of its own and it was Class 1 back in the days, eighties and before. That is when Class 1 was much more an offshore series with such legendary races as the Viareggio - Bastia, and Cowes Torquay being symbols of a past where sea challenging along with speed was an important factor. With three races this can be called a championship, and now its up to see how many competitors turn around and what kind of interest this will bring. In its peak the Endurance Class Series with its name as Powerboat P1 gathered a high interest with some racing towns also having over 100,000 spectators by the sea side watching the races, and at times having twenty plus total boats competing in Supersport and Evolution classes.